There is a lot of interest in more efficient and low impact running form these days. The reason being that many runners are finding fantastic results (less injuries, less effort, more joy, more speed) when they adjust their running technique for maximum efficiency. There are several popular running methods (Pose, Evolution) out there and I have tried several. For myself, I have found ChiRunning to be the most effective and the one I connect with the most. ChiRunning is all about alignment and relaxation and allowing the body to flow in its own rhythm. Proper alignment and relaxation both lead to efficiency and injury prevention. Efficiency and injury prevention lead to less injuries, less impact, increased speed and distance as well as increased joy and fulfillment. Example of common poor running technique. Notice the heel strike, foot landing in front of hips, and a lack of lean resulting in more impact and wasted energy. I found my passion for running in college but a severe knee injury in 2002 kept me from running for over two years. I tried everything! A few doctors and physical therapists even told me I would never be able to run again! I knew it wasn’t running that caused the injury but how I ran that did. After over two years, Bikram Yoga and specific nutrition finally helped heal my knees but running was still painful. After researching and trying several running methods, ChiRunning changed my life. Finding ChiRunning was truly a gift. Not only did ChiRunning change the way I ran, it has allowed me to run injury free and enter the world of ultramarathon running. Even running up to 100 miles a week, ChiRunning has allowed me to be injury free for over 6 years while running faster and with less effort. Another common poor running technique. Notice the lack of core strength resulting in excess fatigue and tension. There were a few reasons that ChiRunning really connected with me. I believe that it isn’t running that causes injury but how we run that does (again, read that sentence a few times). 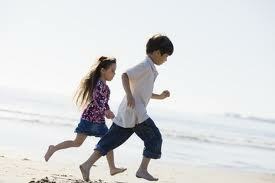 Children can run for what seems like forever and not get tired. Native peoples including some in Africa and the Tarahumara in Mexico seem to be able to run forever without many injuries at all. But why as Americans do runners get injured so often. We have found it acceptable to get injured as a runner. It just happens. Runners expect it. For me, it is unacceptable! An injury is our body telling us that something isn’t correct. When we watch many (not all!) elite athletes, native peoples, and especially children run, they run with very similar form. And that is what ChiRunning is all about. Teaching us to run the way we were born to run. The way we did as kids. Proper ChiRunning technique leading to a very efficient way to run and less impact. Why don’t we run like children anymore? There are many reasons but I will address what I believe are the major factors. Our lifestyles promote poor posture. We sit most of the day. We drive a lot. We carry old injuries which produce ‘bad’ habits and improper ways of moving. What happens then is the body adapts and changes in ways that aren’t normal. The body is designed to move a certain way. Our lifestyle has taught us to hunch over and have poor posture which causes muscles to become ‘tight’ and ‘weak’. Strong, reselient muscles that are meant to support us become weak. Our core muscles become weak and aren’t used when we run. Smaller, weaker muscles need to compensate and perform work that they were not meant to do. Then, when we run, we run less efficiently and with poor biomechanics which causes injuries and can make running less efficient and just plain not fun. Notice that runners with poor form look like they aren’t having fun. Or are they not having fun because they have poor form? Children running naturally with great ChiRunning technique. Another major reason we run with poor form is that we learn quickly from the people we surround ourselves with and watch, whether it is concious or subconciously. And most people in America have poor posture and run with poor technique. A great story I like to tell is about when I was flying from Pennsylvania to Denver one day. Next to me was a blind lady, about 50 years old. The whole flight she sat with ‘perfect’ posture. Very upright, not even using the backseat for support. To some people, maybe she looked stiff. But I could tell she was very relaxed during the whole 4+ hour flight. I finally asked her if she knew that she sat with good posture. She said “I do?”. I replied, “you didn’t know, you don’t try to”. She responded “Everyone doesn’t sit like me? Hm, I never knew, I just sit the way I was meant to sit”. Not being able to see the way most people sit, she sat naturally. She never ‘learned’ to sit poorly. When I watched her walk, perfect ChiWalking technique. Another reason we don’t run like children anymore is because we are taught not to. Many runners I know are taught to ‘power run’. Power running encourages pushing off with the legs to propel ourselves and over stride to increase stride length. ChiRunning believes (and science confirms) this is a very inefficient way to run. And it shows! With all the injuries runners suffer from as well as all the people who believe that running is bad for us. ChiRunning teaches us to run the way we were designed to run. Instead of using the legs to propel us, we lean from the ankles and allow gravity to propel us. Much more efficient. We also don’t over stride which acts like a brake on the body. Power running is like driving with one foot on the gas pedal and one on the brake. Who would do that? Most likely, you! Instead, with ChiRunning we use gravity to our advantage and we cooperate with it to propel us. Our legs naturally open up to the back cooperating with the force of the road/trail which dramatically reduces impact and injuries. Less muscular energy used, less impact. Not only does science back this up, it makes sense. And the results are out. Thousands of runners are finding that ChiRunning dramatically improves their running experience. As a certified Chi Running instructor I would like to address as well as correct quite a few misconceptions about ChiRunning. And I only speak for ChiRunning. I have tried other methods out there and found Chi Running to be the one that works for me. Also, as a scientist, it just makes sense. ChiRunning is not ‘very similiar’ to the Pose and Evolution methods of running (which isn’t to say they aren’t good!). That would be like saying apples and oranges are very similar. Sure they are tasty fruit, not very similar in my opinion. I would not like to get into too many details about how ChiRunning is different. The technique is different and ChiRunning gets into the ‘spiritual’ element of running if desired by the runner. It also brings in the concept of body awareness and being in the present moment which can result in a running meditation. This is not taught, it happens. A runners high, the zone. Focusing on technique when running is like yoga. It gets you into these happy states easier and quicker. Should runners worry about their form? Of course not! Would becoming more efficient allow you to have a more positive experience and to possibly run faster and with less effort? For some people sure. It is silly to think that working on technique does not have a beneficial affect on speed and efficiency. A simple refinement of changing a runners arms to swing back and forth versus side to side can significantly decrease energy expenditure. Many runners do not realize they are running inefficiently. That is one reason I video tape. And most importantely, many runners do not know how to change their running form to become more efficient. ChiRunning has found the most effective way to do it with easy to learn lessons. Some folks believe ChiRunning would only benefit ultrarunners or runners who appreciate ‘eastern’ wisdom. It is true that ChiRunning is not for competitive sprinters who run 800 meter events or less. They want to maximize power by pushing off with the legs and that is fine. But how many runners actually run sprint events? ChiRunning will benefit beginner runners, recreational runners, injured runners, and competitive athletes. Also, runners looking to do 5K races as well as runners doing long events such marathons and ultras greatly benefit from ChiRunning. A major misconception I would like to address is that ChiRunning is all about ‘minimalist’ footwear and getting rid of heel striking. We teach runners to run in whatever shoe they are comfortable in and appropriate for the terrain they are doing. Does running barefoot once in a while improve running technique (therefore speed and efficiency)? Yes. Does it help teach you to run lighter and reduce injuries. Yep. ChiRunning teaches you to run as if you were barefoot while wearing the shoes you want to wear. Lighter, more efficient, less impact. A holistic running approach. In ChiRunning we teach the idea of ‘Gradual Progress’. Results do not and should not happen over night. ChiRunning is a practice and is not goal oriented. It is process oriented which results in a much deeper sense of joy from running then if it was stricly an exercise or work out. Also, every aspect of ChiRunning is not for every runner or person out there. And that is great, we are all unique. Science backs up that ChiRunning is more efficient. In ChiRunning, we cooperate with forces and use gravity instead of working against it. Sounds simple to me even though I know it isn’t. But ultimately, it needs to work for the runner. We introduce many concepts and hopefully the runner will connect with some of them. For many runners, they connect and love the whole concept. I would like to emphasize that readers try these different running methods (Truly give them a shot, ideally from a certified instructor) and make your own opinions. There are studies out there showing how low impact methods do help with efficiency and speed. But who cares, try it and determine for yourself! This entry was posted in online running coach and tagged Bozeman, ChiRunning, Damian, Holistic Running, method, Montana, pose, Stoy, trainer, Wholistic Running by Wholistic Running. Bookmark the permalink.